Butter (/ˈbʌtə/) is a dairy product with high butterfat content which is solid when chilled and at room temperature in some regions, and liquid when warmed. It is made by churning fresh or fermented cream or milk to separate the butterfat from the buttermilk. It is generally used as a spread on plain or toasted bread products and a condiment on cooked vegetables, as well as in cooking, such as baking, sauce making, and pan frying. Butter consists of butterfat, milk proteins and water, and often added salt. See also Types of butter. Most frequently made from cow's milk, butter can also be manufactured from the milk of other mammals, including sheep, goats, buffalo, and yaks. Salt (such as dairy salt), flavorings (such as garlic) and preservatives are sometimes added to butter. Rendering butter, removing the water and milk solids, produces clarified butter or ghee, which is almost entirely butterfat. Butter is a water-in-oil emulsion resulting from an inversion of the cream, where the milk proteins are the emulsifiers. Butter remains a firm solid when refrigerated, but softens to a spreadable consistency at room temperature, and melts to a thin liquid consistency at 32 to 35 °C (90 to 95 °F). The density of butter is 911 grams per Litre (0.950 lb per US pint). It generally has a pale yellow color, but varies from deep yellow to nearly white. Its natural, unmodified color is dependent on the source animal's feed and genetics, but the commercial manufacturing process commonly manipulates the color with food colorings like annatto or carotene. The word butter derives (via Germanic languages) from the Latin butyrum, which is the latinisation of the Greek βούτυρον (bouturon). This may be a compound of βοῦς (bous), "ox, cow" + τυρός (turos), "cheese", that is "cow-cheese". The word turos ("cheese") is attested in Mycenaean Greek. The unlatinized form is found in the name butyric acid, a compound found in rancid butter and dairy products such as Parmesan cheese. In general use, the term "butter" refers to the spread dairy product when unqualified by other descriptors. The word commonly is used to describe puréed vegetable or seed and nut products such as peanut butter and almond butter. It is often applied to spread fruit products such as apple butter. Fats such as cocoa butter and shea butter that remain solid at room temperature are also known as "butters". Non-dairy items that have a dairy-butter consistency may use "butter" to call that consistency to mind, including food items such as maple butter and witch's butter and nonfood items such as baby bottom butter, hyena butter, and rock butter. Unhomogenized milk and cream contain butterfat in microscopic globules. These globules are surrounded by membranes made of phospholipids (fatty acid emulsifiers) and proteins, which prevent the fat in milk from pooling together into a single mass. Butter is produced by agitating cream, which damages these membranes and allows the milk fats to conjoin, separating from the other parts of the cream. Variations in the production method will create butters with different consistencies, mostly due to the butterfat composition in the finished product. Butter contains fat in three separate forms: free butterfat, butterfat crystals, and undamaged fat globules. In the finished product, different proportions of these forms result in different consistencies within the butter; butters with many crystals are harder than butters dominated by free fats. Churning produces small butter grains floating in the water-based portion of the cream. This watery liquid is called buttermilk—although the buttermilk most common today is instead a directly fermented skimmed milk. The buttermilk is drained off; sometimes more buttermilk is removed by rinsing the grains with water. Then the grains are "worked": pressed and kneaded together. When prepared manually, this is done using wooden boards called scotch hands. This consolidates the butter into a solid mass and breaks up embedded pockets of buttermilk or water into tiny droplets. Commercial butter is about 80% butterfat and 15% water; traditionally made butter may have as little as 65% fat and 30% water. Butterfat is a mixture of triglyceride, a triester derived from glycerol and three of any of several fatty acid groups. Butter becomes rancid when these chains break down into smaller components, like butyric acid and diacetyl. The density of butter is 0.911 g/cm3 (0.527 oz/in3), about the same as ice. In some countries, butter is given a grade before commercial distribution. Before modern factory butter making, cream was usually collected from several milkings and was therefore several days old and somewhat fermented by the time it was made into butter. Butter made from a fermented cream is known as cultured butter. During fermentation, the cream naturally sours as bacteria convert milk sugars into lactic acid. The fermentation process produces additional aroma compounds, including diacetyl, which makes for a fuller-flavored and more "buttery" tasting product. (p35) Today, cultured butter is usually made from pasteurized cream whose fermentation is produced by the introduction of Lactococcus and Leuconostoc bacteria. Dairy products are often pasteurized during production to kill pathogenic bacteria and other microbes. Butter made from pasteurized fresh cream is called sweet cream butter. Production of sweet cream butter first became common in the 19th century, with the development of refrigeration and the mechanical cream separator. (p33) Butter made from fresh or cultured unpasteurized cream is called raw cream butter. While butter made from pasteurized cream may keep for several months, raw cream butter has a shelf life of roughly ten days. Several "spreadable" butters have been developed. These remain softer at colder temperatures and are therefore easier to use directly out of refrigeration. Some methods modify the makeup of the butter's fat through chemical manipulation of the finished product, some manipulate the cattle's feed, and some incorporate vegetable oil into the butter. "Whipped" butter, another product designed to be more spreadable, is aerated by incorporating nitrogen gas—normal air is not used to avoid oxidation and rancidity. The earliest butter would have been from sheep or goat's milk; cattle are not thought to have been domesticated for another thousand years. An ancient method of butter making, still used today in parts of Africa and the Near East, involves a goat skin half filled with milk, and inflated with air before being sealed. The skin is then hung with ropes on a tripod of sticks, and rocked until the movement leads to the formation of butter. In the Mediterranean climate, unclarified butter spoils quickly— unlike cheese, it is not a practical method of preserving the nutrients of milk. The ancient Greeks and Romans seemed to have considered butter a food fit more for the northern barbarians. A play by the Greek comic poet Anaxandrides refers to Thracians as boutyrophagoi, "butter-eaters". In his Natural History, Pliny the Elder calls butter "the most delicate of food among barbarous nations", and goes on to describe its medicinal properties. Later, the physician Galen also described butter as a medicinal agent only. Historian and linguist Andrew Dalby says most references to butter in ancient Near Eastern texts should more correctly be translated as ghee. Ghee is mentioned in the Periplus of the Erythraean Sea as a typical trade article around the first century CE Arabian Sea, and Roman geographer Strabo describes it as a commodity of Arabia and Sudan. In India, ghee has been a symbol of purity and an offering to the gods—especially Agni, the Hindu god of fire—for more than 3000 years; references to ghee's sacred nature appear numerous times in the Rigveda, circa 1500–1200 BCE. The tale of the child Krishna stealing butter remains a popular children's story in India today. Since India's prehistory, ghee has been both a staple food and used for ceremonial purposes, such as fueling holy lamps and funeral pyres. In antiquity, butter was used for fuel in lamps as a substitute for oil. The Butter Tower of Rouen Cathedral was erected in the early 16th century when Archbishop Georges d'Amboise authorized the burning of butter instead of oil, which was scarce at the time, during Lent. Across northern Europe, butter was sometimes treated in a manner unheard-of today: it was packed into barrels (firkins) and buried in peat bogs, perhaps for years. Such "bog butter" would develop a strong flavor as it aged, but remain edible, in large part because of the unique cool, airless, antiseptic and acidic environment of a peat bog. Firkins of such buried butter are a common archaeological find in Ireland; the National Museum of Ireland – Archaeology has some containing "a grayish cheese-like substance, partially hardened, not much like butter, and quite free from putrefaction." The practice was most common in Ireland in the 11th–14th centuries; it ended entirely before the 19th century. Like Ireland, France became well known for its butter, particularly in Normandy and Brittany. By the 1860s, butter had become so in demand in France that Emperor Napoleon III offered prize money for an inexpensive substitute to supplement France's inadequate butter supplies. A French chemist claimed the prize with the invention of margarine in 1869. The first margarine was beef tallow flavored with milk and worked like butter; vegetable margarine followed after the development of hydrogenated oils around 1900. Until the 19th century, the vast majority of butter was made by hand, on farms. The first butter factories appeared in the United States in the early 1860s, after the successful introduction of cheese factories a decade earlier. In the late 1870s, the centrifugal cream separator was introduced, marketed most successfully by Swedish engineer Carl Gustaf Patrik de Laval. This dramatically sped up the butter-making process by eliminating the slow step of letting cream naturally rise to the top of milk. Initially, whole milk was shipped to the butter factories, and the cream separation took place there. Soon, though, cream-separation technology became small and inexpensive enough to introduce an additional efficiency: the separation was accomplished on the farm, and the cream alone shipped to the factory. By 1900, more than half the butter produced in the United States was factory made; Europe followed suit shortly after. In 1920, Otto Hunziker authored The Butter Industry, Prepared for Factory, School and Laboratory, a well-known text in the industry that enjoyed at least three editions (1920, 1927, 1940). As part of the efforts of the American Dairy Science Association, Professor Hunziker and others published articles regarding: causes of tallowiness (an odor defect, distinct from rancidity, a taste defect); mottles (an aesthetic issue related to uneven color); introduced salts; the impact of creamery metals and liquids; and acidity measurement. These and other ADSA publications helped standardize practices internationally. In the United States, butter has traditionally been made into small, rectangular blocks by means of a pair of wooden butter paddles. It is usually produced in 4-ounce (1⁄4 lb; 110 g) sticks that are individually wrapped in waxed or foiled paper, and sold as a 1 pound (0.45 kg) package of 4 sticks. This practice is believed to have originated in 1907, when Swift and Company began packaging butter in this manner for mass distribution. The dominant shape east of the Rocky Mountains is the Elgin, or Eastern-pack shape, named for a dairy in Elgin, Illinois. The sticks measure 4 3⁄4 by 1 1⁄4 by 1 1⁄4 inches (121 mm × 32 mm × 32 mm) and are typically sold stacked two by two in elongated cube-shaped boxes. In 1997, India produced 1,470,000 metric tons (1,620,000 short tons) of butter, most of which was consumed domestically. Second in production was the United States (522,000 t or 575,000 short tons), followed by France (466,000 t or 514,000 short tons), Germany (442,000 t or 487,000 short tons), and New Zealand (307,000 t or 338,000 short tons). France ranks first in per capita butter consumption with 8 kg per capita per year. In terms of absolute consumption, Germany was second after India, using 578,000 metric tons (637,000 short tons) of butter in 1997, followed by France (528,000 t or 582,000 short tons), Russia (514,000 t or 567,000 short tons), and the United States (505,000 t or 557,000 short tons). New Zealand, Australia, and the Ukraine are among the few nations that export a significant percentage of the butter they produce. Different varieties are found around the world. Smen is a spiced Moroccan clarified butter, buried in the ground and aged for months or years. A similar product is maltash of the Hunza Valley, where cow and yak butter can be buried for decades, and is used at events such as weddings. Yak butter is a specialty in Tibet; tsampa, barley flour mixed with yak butter, is a staple food. Butter tea is consumed in the Himalayan regions of Tibet, Bhutan, Nepal and India. It consists of tea served with intensely flavored—or "rancid"—yak butter and salt. In African and Asian developing nations, butter is traditionally made from sour milk rather than cream. It can take several hours of churning to produce workable butter grains from fermented milk. 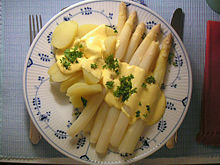 Hollandaise sauce served over white asparagus and potatoes. Normal butter softens to a spreadable consistency around 15 °C (60 °F), well above refrigerator temperatures. The "butter compartment" found in many refrigerators may be one of the warmer sections inside, but it still leaves butter quite hard. Until recently, many refrigerators sold in New Zealand featured a "butter conditioner", a compartment kept warmer than the rest of the refrigerator—but still cooler than room temperature—with a small heater. Keeping butter tightly wrapped delays rancidity, which is hastened by exposure to light or air, and also helps prevent it from picking up other odors. Wrapped butter has a shelf life of several months at refrigerator temperatures. Butter can also be frozen to further extend its storage life. "French butter dishes" or "Acadian butter dishes" have a lid with a long interior lip, which sits in a container holding a small amount of water. Usually the dish holds just enough water to submerge the interior lip when the dish is closed. Butter is packed into the lid. The water acts as a seal to keep the butter fresh, and also keeps the butter from overheating in hot temperatures. This method lets butter sit on a countertop for several days without spoiling. Once butter is softened, spices, herbs, or other flavoring agents can be mixed into it, producing what is called a compound butter or composite butter (sometimes also called composed butter). Compound butters can be used as spreads, or cooled, sliced, and placed onto hot food to melt into a sauce. Sweetened compound butters can be served with desserts; such hard sauces are often flavored with spirits. In Poland, the butter lamb (Baranek wielkanocny) is a traditional addition to the Easter Meal for many Polish Catholics. Butter is shaped into a lamb either by hand or in a lamb-shaped mould. Butter is also used to make edible decorations to garnish other dishes. Butter is used for sautéing and frying, although its milk solids brown and burn above 150 °C (250 °F)—a rather low temperature for most applications. The smoke point of butterfat is around 200 °C (400 °F), so clarified butter or ghee is better suited to frying. (p37) Ghee has always been a common frying medium in India, where many avoid other animal fats for cultural or religious reasons. As butter is essentially just the milk fat, it contains only traces of lactose, so moderate consumption of butter is not a problem for lactose intolerant people. People with milk allergies may still need to avoid butter, which contains enough of the allergy-causing proteins to cause reactions. Whole milk, butter and cream have high levels of saturated fat. Butter is a good source of Vitamin A. The molecular composition of butter which contribute to butter's distinct flavor includes: fatty acids, lactones, methyl ketones, diacetyl and dimethyl sulfide. When foods containing butter are baked, the concentrations of methyl ketones and lactones increase to provide the flavor of butter. ^ "A Substitute for 'Annatto' in Butter". Nature. Nature. Retrieved 2 November 2018. ^ a b c d e f g h i j McGee, Harold (2004). On Food and Cooking: The Science and Lore of the Kitchen. New York, New York: Scribner. ISBN 978-0-684-80001-1. LCCN 2004058999. OCLC 56590708. ^ "Article on sweet cream, whey cream, and the butters they produce". Kosher. Archived from the original on 20 February 2012. Retrieved 24 October 2014. ^ Doane, Charles Francis (12 November 2017). "Whey butter". Washington, D.C. : U.S. Dept. of Agriculture, Bureau of Animal Industry. Archived from the original on 28 May 2017. Retrieved 29 December 2017 – via Internet Archive. ^ "No buts, it's Rucava butter!". Public Broadcasting of Latvia. LETA. 6 September 2018. Retrieved 11 September 2018. ^ Bostock and Riley translation. Book 28, chapter 35. ^ a b Web Exhibits: Butter. Ancient Firkins Archived 21 October 2005 at the Wayback Machine. ^ Hunziker, O F (1920). The Butter Industry, Prepared for Factory, School and Laboratory. LaGrange, IL: author. ^ Hunziker, O F; D. Fay Hosman (1 November 1917). "Tallowy Butter—its Causes and Prevention" (PDF). Journal of Dairy Science. American Dairy Science Association. 1 (4): 320–346. doi:10.3168/jds.S0022-0302(17)94386-3. Archived from the original on 7 December 2008. Retrieved 28 June 2008. ^ Hunziker, O F; D. Fay Hosman (1 March 1920). "Mottles in Butter—Their Causes and Prevention" (PDF). Journal of Dairy Science. American Dairy Science Association. 3 (2): 77–106. doi:10.3168/jds.S0022-0302(20)94253-4. Archived from the original on 11 October 2008. Retrieved 28 June 2008. ^ Hunziker, O F; W. A. Cordes; B. H. Nissen (1 September 1929). "Studies on Butter Salts" (PDF). Journal of Dairy Science. American Dairy Science Association. 11 (5): 333–351. doi:10.3168/jds.S0022-0302(28)93647-4. Archived from the original on 11 October 2008. Retrieved 28 June 2008. ^ Hunziker, O F; W. A. Cordes; B. H. Nissen (1 March 1929). "Metals in Dairy Equipment. Metallic Corrosion in Milk Products and its Effect on Flavor" (PDF). Journal of Dairy Science. American Dairy Science Association. 12 (2): 140–181. doi:10.3168/jds.S0022-0302(29)93566-9. Archived from the original on 7 September 2008. Retrieved 28 June 2008. ^ Hunziker, O F; W. A. Cordes; B. H. Nissen (1 May 1929). "Metals in Dairy Equipment: Corrosion Caused by Washing Powders, Chemical Sterilizers, and Refrigerating Brines" (PDF). Journal of Dairy Science. American Dairy Science Association. 12 (3): 252–284. doi:10.3168/jds.S0022-0302(29)93575-X. Archived from the original on 7 December 2008. Retrieved 28 June 2008. ^ Hunziker, O F; W. A. Cordes; B. H. Nissen (1 July 1931). "Method for Hydrogen Ion Determination of Butter" (PDF). Journal of Dairy Science. American Dairy Science Association. 14 (4): 347–37. doi:10.3168/jds.S0022-0302(31)93478-4. Archived from the original on 7 September 2008. Retrieved 28 June 2008. ^ Web Exhibits: Butter. Eating less butter, and more fat Archived 14 December 2005 at the Wayback Machine. ^ See for example this chart Archived 8 September 2005 at the Wayback Machine from International Margarine Association of the Countries of Europe statistics Archived 30 September 2005 at the Wayback Machine. Retrieved 4 December 2005. ^ Milton E. Parker (1948). "Princely Packets of Golden Health (A History of Butter Packaging)" (PDF). Archived from the original (PDF) on 6 October 2006. Retrieved 15 October 2006. ^ a b c d "A Better Stick of Butter?". Cook's Illustrated (77): 3. November – December 2005. ^ "Commercial Butter Making and Packaging Machines". Schier Company, Inc. Archived from the original on 20 May 2018. Retrieved 19 May 2018. ^ "Envoyé spécial". francetv info. Archived from the original on 18 December 2010. Retrieved 24 October 2014. ^ Statistics from USDA Foreign Agricultural Service (1999). Dairy: Word Markets and Trade Archived 23 September 2005 at the Wayback Machine. Retrieved 1 December 2005. The export and import figures do not include trade between nations within the European Union, and there are inconsistencies regarding the inclusion of clarified butterfat products (explaining why New Zealand is shown exporting more butter in 1997 than was produced). ^ Salopek, Paul (23 January 2018). "Here, the Homemade Butter Is Aged for Half a Century". National Geographic Society. Archived from the original on 24 January 2018. ^ Crawford et al., part B, section III, ch. 1: Butter Archived 3 February 2006 at the Wayback Machine. Retrieved 28 November 2005. ^ Bring back butter conditioners Archived 27 September 2007 at the Wayback Machine. Retrieved 27 November 2005. The feature has been phased out for energy conservation reasons. ^ How Long Does Butter Last? Archived 6 October 2014 at the Wayback Machine. Retrieved 03, October 2014. ^ From data here  Archived 24 December 2005 at the Wayback Machine, one teaspoon of butter contains 0.03 grams of lactose; a cup of milk contains 400 times that amount. ^ Allergy Society of South Africa. Milk Allergy & Intolerance Archived 26 November 2005 at the Wayback Machine. Retrieved 27 November 2005. ^ "Nutrition for Everyone: Basics: Saturated Fat - DNPAO - CDC". www.cdc.gov. Archived from the original on 29 January 2014. Retrieved 1 March 2014. ^ Choices, NHS. "How to eat less saturated fat - Live Well - NHS Choices". www.nhs.uk. Archived from the original on 24 April 2015. Retrieved 26 April 2015. McGee, Harold (2004). On Food and Cooking: The Science and Lore of the Kitchen. New York, New York: Scribner. ISBN 978-0-684-80001-1. LCCN 2004058999. OCLC 56590708. pp. 33–39, "Butter and Margarine"
Dalby, Andrew (2003). Food in the Ancient World from A to Z[dead link], 65. Google Print. ISBN 0-415-23259-7 (accessed 16 November 2005). Also available in print from Routledge (UK). Michael Douma (editor). WebExhibits' Butter pages. Retrieved 21 November 2005. Grigg, David B. (7 November 1974). The Agricultural Systems of the World: An Evolutionary Approach, 196–198. Google Print. ISBN 0-521-09843-2 (accessed 28 November 2005). Also available in print from Cambridge University Press. "Butter", Food Resource, College of Health and Human Sciences, Oregon State University, 20 February 2007. – FAQ, links, and extensive bibliography of food science articles on butter.